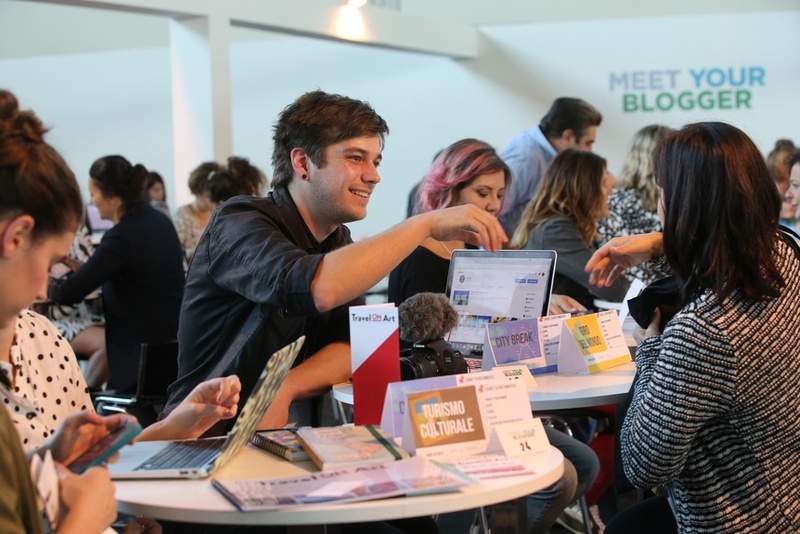 A day dedicated to networking between operators and travel bloggers and social communication experts. ► When and where will it be held? ► Who is aimed at and how much is it? Free for all exhibitors and co-exhibitors featured in the catalogue. €120.00 + VAT if entry ticket is purchases by 30 September. €150.00 + VAT until 10 October and at the door. Apply for Meet your Blogger. During registration, in the “*Description of your activities, reason for attendance and any coverage of previous events” section, remember to mark “Meet your Blogger 2018” and any occasions you previously attended. Advantages? Once selected, you will be able to demonstrate to operators at the show your level of professionalism and the quality of your advice in product communication in relation to the various social media channels and targets. Every selected travel blogger/social communication expert will be given a desk and will be able to meet registered operators in the two-hour slot chosen when they applied (morning or afternoon). They will get to know each other and together identify the best social media product communication solutions aimed at various profiles. If you are a tourism operator, you can get to know the best bloggers to define or strengthen your communication on social media over time, thereby improving your promotion and sales performance. Why take part? Why work with bloggers? It increases brand awareness: when a blogger writes or talks on social media about a product/activity, his/her readers get to know about it, and the blogger builds up positive stimuli that make it desirable. It sells a product/service in a non-self-referential manner: by talking about their own experience, a blogger can strengthen a positive opinion or change a negative perception. Because readers trust the account of a blogger who they regularly follow. Bloggers therefore help communicate a brand through the stories they tell. It brings the company closer to readers by exploring issues and values: are the company website or the brand’s official social media channels not enough? Exploring issues and cross-cutting themes by working with a blogger enables you to widen your public. Transparent and close to people: how nice it is to look behind the scenes of an activity, as told by an exceptional reporter who can experience the everyday reality of a brand in an authentic manner, and talk about strengths, curiosities and values. Professionalism and authority: bloggers’ posts on specific features and their experience enable you to disseminate content that can strengthen the brand/destination. Lead generation: working with a blogger to create informative content such as a guide to a destination or manuals is an excellent strategy through which to generate a list of customer contacts who are truly interested in the activities conducted by the brand. SEO: blogs tend to be among the top results of search engines with long tails. One or more posts about the brand will therefore help it become more visible online. Here, the search for key words relating to your activity will be important. It shares content through social media channels: amplification through dissemination and sharing of content thanks to social media. This gives rise to a digital word-of-mouth process also through the blogger’s readers and followers. How can I increase visibility through digital influencers?